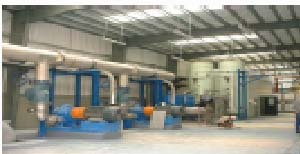 Installation of 1000m3/hr packaged micro-filtration unit. Construction of steel frame building (approx. 700m2), complete with storage, control room, compressors room. Construction of reinforced concrete retaining walls, backwash equalization tank and neutralization tank. Installation of ancillary feed pumps, backwash recycling pumps, backwash wastewater pumps, booster pumps, water softeners, chemical pumps, dosing system and ancillary equipment including instrumentation and control equipment (SCADA). Installation of approx. 3.3km of 150mm dia ductile iron backwash wastewater pipes. Installation of different type of pipes (DN100 to DN600). The services included Design, preparation of bid documents & Construction Supervision.